(Newser) – Before this week began, Mitch McConnell's former chief of staff likened the Senate majority leader's task of getting the GOP's health care bill passed to "a 747 landing on a suburban driveway." It looks like Monday's CBO report just made the runway even smaller. Both Politico and the New York Times report that McConnell now may not even be able to bring the bill up for debate, let alone pass it. 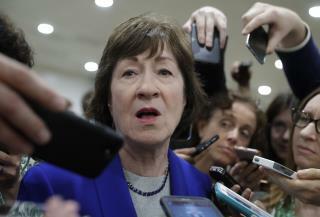 At least four GOP senators have signaled they will oppose a procedural vote on the measure that was scheduled to take place as early as Tuesday, with moderate Sen. Susan Collins of Maine joining Rand Paul, Dean Heller, and Ron Johnson on Monday evening. McConnell can afford only two defections. Thuthan Collinth basing her vote on what the "TheeBO Theth" is laughable. The CBO was way wrong on Obamacare predictions. Collins is a Demhypocrat in Republican clothing. She and Runt Paul want to keep the UnAmerican individual mandate. Drain the swamp.